Gazpacho is a must in this Texas heat. It’s Spanish, not Mexican, although it uses Mexican ingredients like bell pepper (chile dulce) and tomatoes. I bought tomatoes from the Atkinson Family Farm, a 4th generation family farm. Hurray! Jeni, wife of grandson, Bob, sold them to me. Jeni, here’s the gazpacho recipe I promised. To make a good Gazpacho I think it helps to observe boundaries that are imposed by the terroir of Andalucia. Within these boundaries Gazpacho has as many variations as there are Spaniards with opinions. The terroir of Andalucí­a in Southern Spain, occupied by Arabs for 700 years, includes its climate, makeup of the soil and the naturalized products therein. The region has a climate similar to northern Africa so of course the soup must be cold to help relieve the intense heat of the region. “De rigueur” are only those ingredients that are readily available in the Andalucia terroir: olive oil, wine vinegar, cucumbers, onion, stale bread and garlic. This recipe makes a complex, soothing and highly refreshing soup. The taste is clear, with all the ingredients blending and not competing. I omit the strong onion flavor altogether. I also omit the bread because I blend it A LOT, emulsifying the oil, to achieve body and creaminess. The olive oil is present in the taste, but it is a background. 1. Wash all the fruits. I scrub them in a strong solution of salt water, then rinse them. 2. Just place all the ingredients in a blender and churn away until the puree is creamy. So creamy in fact that it almost looks like a cream-based soup. You may have to do this in batches. 3. Chill in the fridge for a day so that the flavors blend. 4. And its ready. Very simple to make. Stir vigorously before serving and garnish with croutons and small cucumber dice. Leave me a comment and let me know how this turns out for you. Hi, Garvin. I’m glad to hear that the Gazpacho was a hit! Congrats! Followed recipe to the letter. Adan, I used Yellow bell pepper. It turned it more Orange. A very nice and summery color. It was Reddish Orange. Oh, Bye the way, my 3 grown daughters RAVED about it! Thanks, you made me one proud Papa Bear! Really looking forward to trying this . Looks like it will be Delicious! !! Especially in this 110 degrees heat here in Thailand. I will let you know after I serve it this weekend! Family will all be out Sunday. Totally Confident of outcome. , Nothing I can BURN! 555. Makes my heart glad to know that you enjoy, and that your friends also. 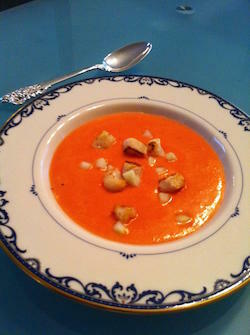 This has become our favorite Gazpacho recipe and prepared it yesterday for a friend who visited us for lunch – excellent! We have always resisted the temptation to throw in a few sprigs of cilantro and you confirmed that we shouldn’t. Also, we used to mix in the vinegar and oil after blending but now follow your advice to blend everything together. Great way to use our own garden ripe tomatoes! Thanks for your great recipes and background information!